Making the Magic Happen will fast track your way to becoming a working Film and TV director. 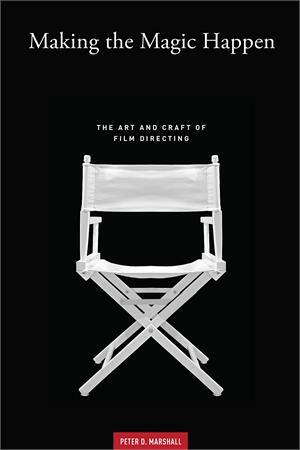 Written by an accomplished and award winning film director who also teaches his craft, Peter D. Marshall shows you why directing a movie is actually simpler than you think. The trick? Learn the "craft" before pursuing the "art." His book Making the Magic Happen demystifies the process of directing by demonstrating what you must first learn about the "craft" of filmmaking. Only then can you apply your logistical and creative skills to the "art" of filmmaking. Peter D. Marshall is a filmmaker and film-directing coach based in Vancouver, Canada. He has worked in the film-and-television industry for over 40 years as a film director, television producer, first assistant director, and TV-series creative consultant. He directing credits include over 30 episodes of television drama, such as John Woo's Once a Thief, Wiseguy, 21 Jump Street, The Black Stallion, and Largo Winch. He has been a directing instructor and film mentor for Raindance Canada, the Vancouver Film School, and the Shanghai Vancouver Film School, as well as the Directors Guild of Canada. He has also developed and continues to teach his own directing work-shops worldwide.